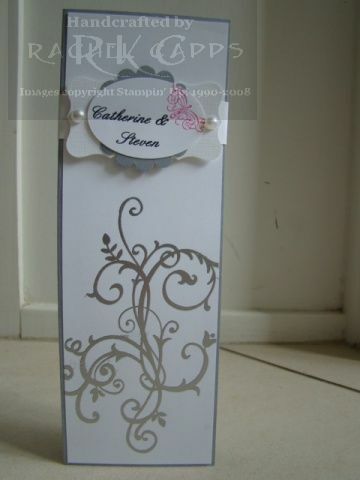 Anyway, I thought I would share with you the journey we had together in coming to a final design for her wedding invitation. We had to be creative even in reaching a decision as Cath lives in Canberra and I live in Sydney. So here goes! 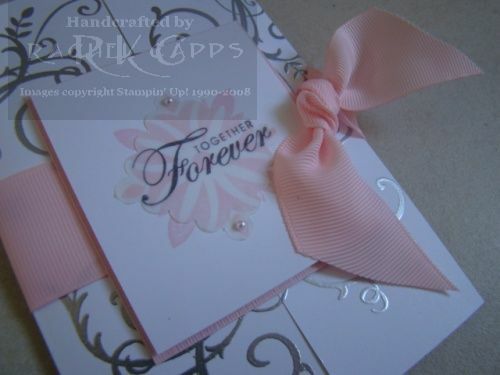 We began with a colour scheme – hers being grey and pink. 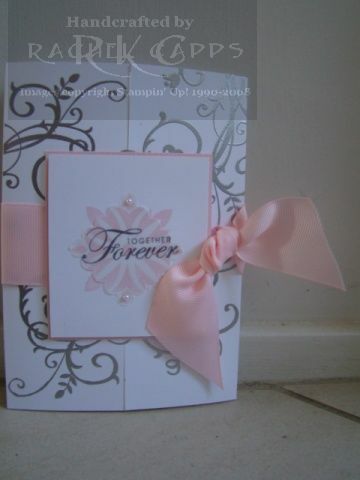 Then I emailed her a few pictures of wedding cards on my blog, and some from the ever-reliable www.splitcoaststampers.com. 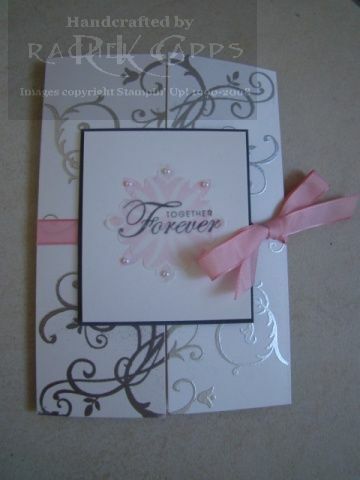 These cards gave her ideas on stamp sets and sizes. She emailed me a few of her favourite stamp sets and from there I mocked up a first sample inviation. 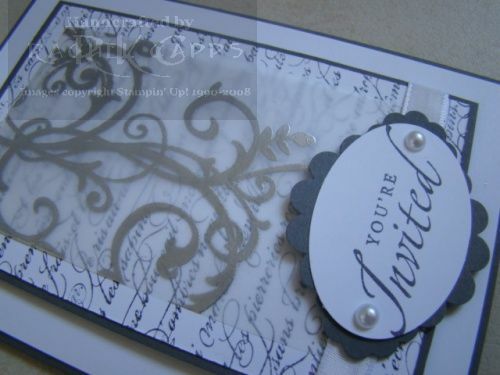 Now, as silver is very close to grey and silver paper has such a lovely shimmer, the first invitation was in silver. I started with a narrow card with a band. 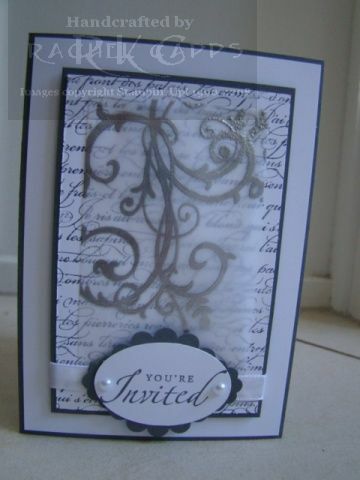 The base was silver cardstock and I layered it with Whisper White on which I’d stamped in Versamark the gorgeous flourish from the Baroque Motifs stamp set. 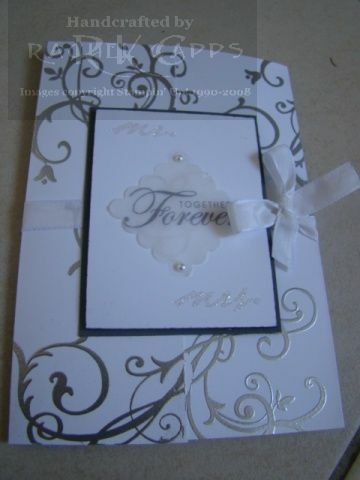 Then I embossed the flourish with silver embossing powder. 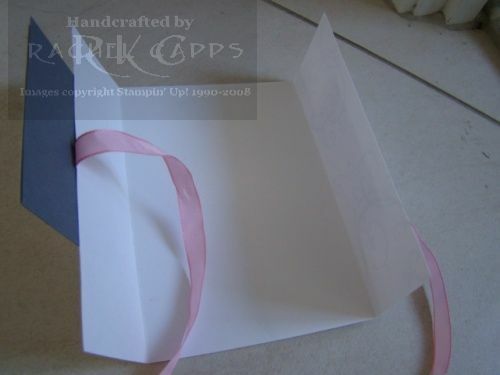 The band was made with a strip of Whisper White textured cardstock and then layered with two Curvy Label punched out pieces, Scallop Cirle punched with silver cardstock and Wide Oval. 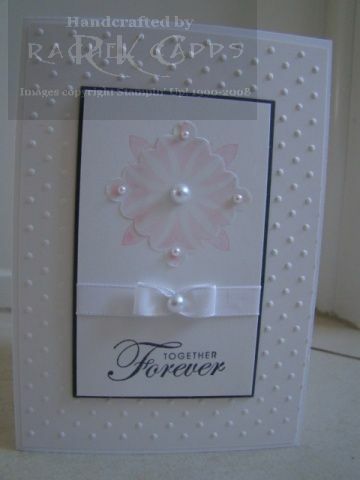 I stamped the a corner from a Vintage Labels (retired) stamp in Melon Mambo and then lastly added two pearls. I’ll be back tomorrow with a few more samples. 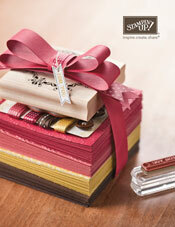 I made this box as a hostess gift for a lovely new customer for the first workshop she hosted in her home. 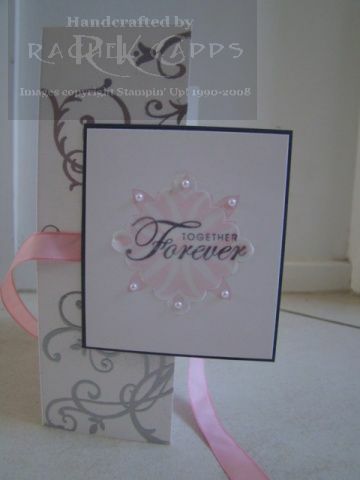 I used the Fancy Favor Big XL die and cut out Crumb Cake cardstock using the Big Shot. 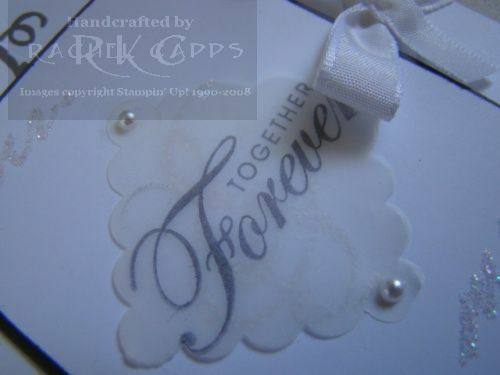 Then I rolled Scribble in Whisper White craft ink along the bottom of the box. 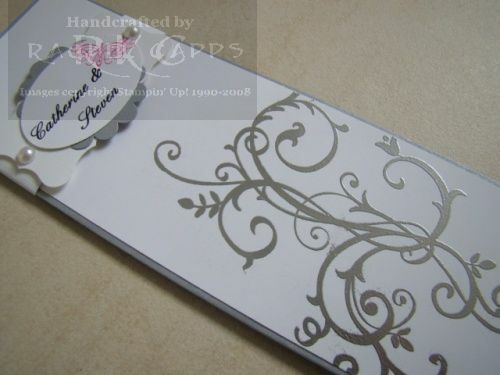 Next I punched out Chocolate Chip cardstock with the Fancy Flower punch (currently not available at the date of blog post). 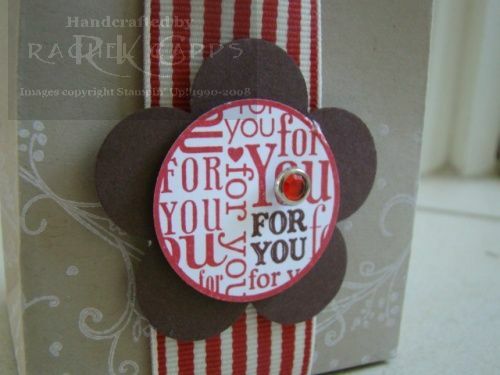 Then I layered it with the ‘For You Flower’ which I had stamped in Real Red ink and coloured the “for you” with my Chocolate Chip marker pen. 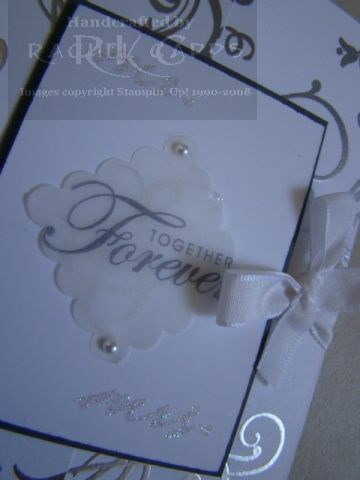 Then I punched it out with the 1 3/8″ circle punch and added a Rhinestone brad. 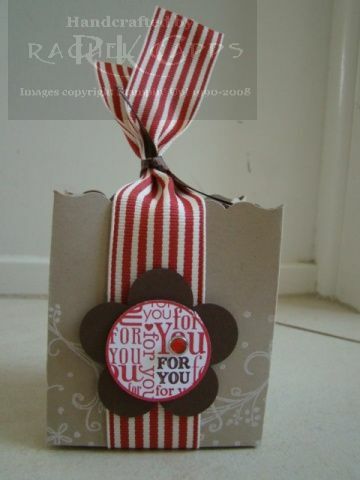 The last touch was to add the striped Riding Hood Red grosgrain ribbon (retired) and tie it together at the top with 1/4″ chocolate chip grosgrain ribbon (retired).